This is one of my favourite breakfast item here in the Capital. I deliberately have it placed on my blue mug to let you have a good idea of the size. All for a modest sum of RMB 3.00 (SGD 0.60). 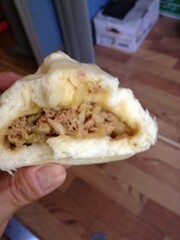 I've never liked the buns here when I was in southern Taobaoland coz they are very stingy with the filling. 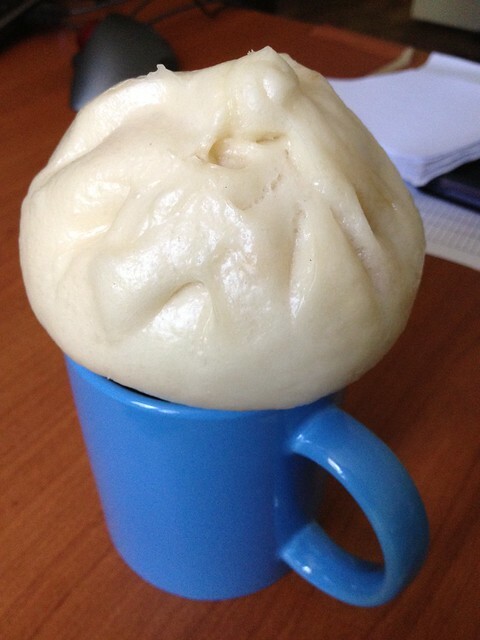 It is almost all bun and a token pinch of something inside. It's different here as you can see. The meat filling with cabbage is very generous. It is even cheaper to eat outside the capital. So for the local folks, they are used to the travelling and the lunch portion i.e. in the Capital would not add as much to their daily costs. When I wrote that entry, I was talking about the interesting contrast where usually an expensive city is pricey in every aspect. The relatively cheap food is surprisingly if not, certainly most welcomed.